In certain places, such as Mallorca, the number of cyclists has greatly increased. Cycling lets you do sport while seeing the amazing things the island has to offer, which makes it a sport with lots of advantages. However, once we've done a bunch of kilometres, it's time to stop, rest and have great conversation with others who share our passion. That's when we look for place to meet up and have a coffee or beer; and we come across cycling bars. It's true, cycling cafés are a trend that's already caught on throughout the rest of Europe, and now it's also happening in our country, which, of course, includes the island. These cycling bars are temples for the sport's enthusiasts. It's not just about having something to drink, but also about being able to store your bike, fix it if you have an issue, talk about cycling, buy bikes, take part in events on the subject, etc. while in some of them there are even TVs showing the biggest races. In just a few years Mallorca has come to have some of these theme bars, while others are just bike friendly and in solidarity with cyclists, allowing them to park their bike in a safe place. Discover Mallorca's bike bars today! La Terraza in Palma de Mallorca is Dutch-operated, and that's why they deeply know what loving bicycles is all about. The décor fits the theme, and in addition to trying Dutch beer, there are cycling jerseys from a variety of teams and cycling clubs that have trained on the island over the years. Rapha is a bike clothing brand with shops all over the world that decided to start a cycling club to build up an international community and now it has more than 22 clubhouses in 13 countries. The establishment, which opened in 2017, and is located in Palma de Mallorca, is one of the cycling bars in Mallorca and a meeting point for cyclists where events and routes take place. It includes a shop and café with videos and books to delve into the history of the sport. It serves coffee, snacks and light meals. This bar is a meeting point for cyclists in Sa Pobla practically year round. It has a huge selection of drinks and also has services for those who love bikes: a pump for inflating tyres, sports nutrition, basic spare parts, bike parking, bike hire, TVs, etc. Modern day shops offer an extra: emotions and food for their customers. This is what Cycling Planet does, which is located in Alaró, where you can have a sandwich while getting your bike fixed. A bike mechanic workshop (with sandwiches, drinks, a selection of coffees, pastries) that's also stimulating. Its walls, the bar, tables and benches are made out of Siberian pine that was used in Palma Arena's Velodrome, built in 2007 for hosting the Track Cycling World Championships. In Palma de Mallorca The Workshop has got it all. On the cycling bar route, they let you hire bikes, do routes and it's also a restaurant-café with the best nutritious food for athletes. It's decorated with bikes hanging from the walls, and that says it all. Even though they're not cycle cafés, lots of the bars on the island are familiar with the fact that cyclists do routes and provide services for them. In the town of Llubí, S’acustic Café is flies a Cycling Friendly banner and has a varied menu, as well as one that's especially for cyclists. You can park your bikes there in an exclusive parking area for bikes and they have sports channels on the TV. Another bar which keeps the cyclists doing routes in the Campanet area in mind is Bar Club. Since it's in the centre of the northern part of the Sierra de Tramuntana mountain range, it's a required stop for cycling groups who have decided to travel around the area. Lunches, snacks and breakfasts on a roomy terrace. 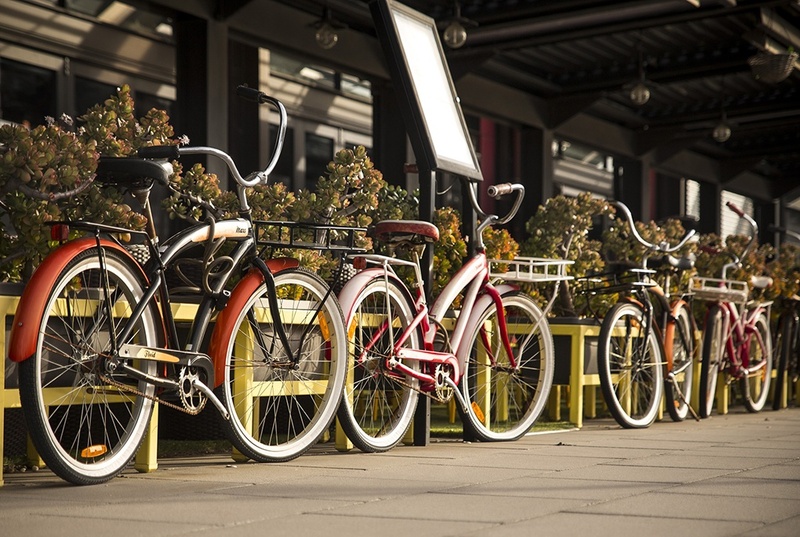 At Hotels VIVA we're aware of how many cycling enthusiasts there are on the island. For this reason, we've got accommodations which are specifically tailored to this type of customer. VIVA Blue & Spa: A cyclist's paradise. It has one of the most cutting edge cycling stations on the island so you can store your bike in the safest conditions possible. Yet, if you haven't brought one with you, you can also just hire one! VIVA Sunrise: This hotel has been designed for you to be able to combine your favourite sport with a family vacation, since, while you use the hotel as your training centre, your kids will be able to enjoy a wide range of organised activities. Vanity Golf by VIVA: Ideal for individuals who want to enjoy relaxing on the island while doing their favourite sport at the same time. Since the hotel features two pools, a solarium, as well as another indoor heated pool with hydro therapy circuit, and also has sports facilities such as a fitness room, a multi-sport court, a archery target practice area and many other services. VIVA Eden Lago: It has 4 tennis courts, cycling, multi-sport court, gym, spinning room and mini-golf. It's an athletes paradise! It also has a cycling station with healthy snacks and isotonic sports drinks for your trips around the island. VIVA Vanity Suite & Spa: This Adults Only Hotel has been designed to provide the utmost wellbeing for your body and mind since it has sports facilities like a fitness room, a multi-sport court, ping-pong, pool, an archery target practice area and many other services. It's perfect for sports enthusiasts who don't want to miss out on relaxing as well.